Are you looking for a quality West Linn roof repair for your home? 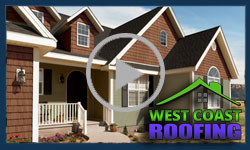 West Coast Roofing offers fast and professional roof repair for homes and businesses throughout the West Linn area. The weather in the Pacific Northwest can be severe, and no matter how new or old your roof might be, West Linn area roofs are more susceptible to leaking and damage than roofs located in other areas. The need for roof repair in West Linn is common and West Coast Roofing has the experience and knowledge to help you have your West Linn roof repaired quickly so that it will continue to protect the investment that you’ve made in your West Linn area home. Whether you need an emergency roof or gutter repair or you are contemplating a new roof installation, West Coast Roofing can help you assess the damage to your roof and decide on the best approach for your West Linn roof repair. We respond quickly so that you receive a rapid evaluation of your roof and a lasting roof repair for your West Linn area home. Storm damage occurs frequently to roofs in the West Linn area. At West Coast roofing, our West Linn roof repair experts will thoroughly inspect your West Linn area home including the siding, gutters, flashing, roof vents, awnings, screens and downspouts. And we will document the need for your West Linn roof repair in detail for your insurance company to ensure that you receive the proper roof repair that is necessary to protect your West Linn area home. Do you have a West Linn area roof in need of repair? Contact West Coast Roofing today and we can help you assess the condition of your damaged roof and provide you with a fast and quality West Linn roof repair.